Show Floor Detective – SMART-reg International, Inc.
Show Floor Detective solves the problem of attendees not being able to remember the exhibitors they visited on the show floor and who scanned their badge. 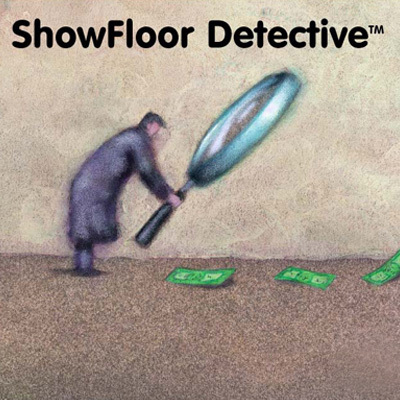 Show Floor Detective empowers the attendees to track down the exhibitors they visited on the show floor through a portal on the SMART-reg website. They simply provide their badge number and are able to retrieve the exhibitor company name, website and e-mail address of the booths they visited. Furthermore, the exhibitor is alerted to the download and this information can be imported into CRM systems. As an additional resource, we can manage the following for attendees to download and view. Enhances the exhibitors’ lead generation efforts by providing attendees the ability to request material and send their contact info to exhibitors from their smart phone to meet live during the show. Find the opportunity before the competition. Streamline data collection by automatically collecting attendees’ up-to-date contact info and social profiles directly into back-end systems.